Ministry of Agriculture,Forestry and Fisheries statistics on marine products in cold storage facilities around Japan were released on January 15 (PDF, Excel format). I've extracted the latest figures for whale meat and updated my graphs accordingly. My graphs themselves also get a bit of a revamp this time. Also, I'm thinking about making the MS Excel worksheet I maintain which contains the extracted figures readily available on the Internet somehow. I'm happy to provide copies in the meantime until I get something arranged. The new graphs below might have the odd mistake left in them, but I'll double check all the values are correct again when I do next month's update. ... and a higher than average month for incoming stock. The larger than average incoming stock in November limited the overall fall in stock, but the stockpile looks likely to dive into the 2,000 ~ 3,000 range by either the year end, or by the end of January. I'm predicting that in the coming months we'll see stocks mark their lowest level for quite some time. Perhaps by the end of February (or otherwise March) we will see a jump in volume due to the return to Japan of the first load of by-product from the JARPA II 2007/2008 season. The JARPA fleet's resupply vessel, the Oriental Bluebird has apparently been seen in the Southern Ocean in the last week, and should return to Japan several weeks in advance of the rest of the fleet, carrying around half of the research programme by-product in it's hold. For a change I decided to plot the incoming and outgoing stock volumes in a cumulative fashion. This gives a bit more information than the standard "Annual volumes" graph that I have been producing until now. Basically I've plotted data for each of the 4 years available, so we can see how the total volume of outgoing and incoming stock progresses over the course of each year, and how this has varied in recent times. One important note is that because data for January 2004 is not available (it starts from Feb-2004), I've chosen to display the Jan-04 values for incoming and outgoing stock as the same amount for Jan-05. As illustrated, outgoing stock has been clearly increasing in each year since 2004, when the available data set starts. The most significant feature is the large increase in mid 2006, which was when the first JARPA II by-product auction took place. However we also see that the increasing trend has taken a pause in the second half of 2007, which I would put down largely to the market having less stock available in 2007 than in 2006. On the incoming side, we see that supply in 2004 and 2005 was roughly equivalent. Although the meat hit the stockpile figures at different times during the year, the end result was the same. Supply was up in 2006 with the start of JARPA II, but down again in 2007 due to the 2006/2007 JARPA II season being cut short. 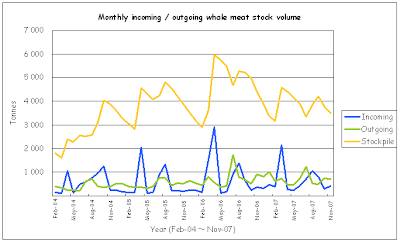 Back to my more traditional annual volumes graph, here we see in 2007 (with one month's figures outstanding) that the outgoing stock volume is almost 500 tonnes higher than the incoming stock volume for the year. This difference will most certainly increase again when December's figures are included. The gap between outgoing stock volumes and incoming stock volumes in 2007 has been made possible due to the existence of the stockpile. November's outgoing stock figure wasn't especially large, but as the New Year season in Japan sees additional whale meat related festivities taking place, I'm predicting that the stockpile will drop another 500 tonnes by the 2007 year end. Hard to say precisely though, due to the unpredictability of the incoming stock figure (presumably including meat from by-caught whales). This year I've thrown away the figures for 2004, as I couldn't calculate a proper 12-month moving average value for them (less than 12 months available to calculate the average with). Hence this graph now starts from Jan-05. 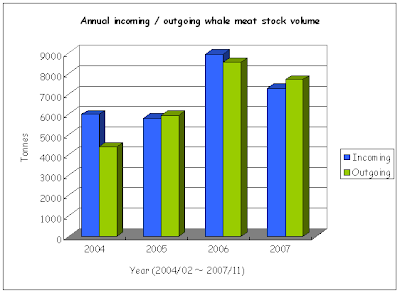 As we see, average outgoing stock in 2007 was running at a level that would see a fair amount more meat leave stockpiles than came on during the year. This graph is on holiday right now (I've not updated it yet), but a run down of the changes in November is below. Stock levels continued to fall in Ishinomaki, Tokyo and Kushiro, with the pace of decrease in Tokyo stocks particularly looking likely to put Tokyo volume down into 3rd place in the next couple of months. Osaka, a known consumption area, on the other hand saw an increase of 46 tonnes. Presumably some of this meat is shipped in from regional stockpiles in areas like Kushiro and Ishinomaki. Hakodate and Shimonoseki volumes put them in 5th and 6th place respectively, while Yokohama made it's way back into 7th place (first time in a while that it has appeared). December 2007 figures are out on February 12. Australia is supporting a terrorist group by having Sea Shepherd offices in nearly every city! Australia along with the USA is among a axis of evil, polluting the world with eco-terrorism. Thats my opinion anyway. Sea Shepherd threw butyric acid onto the Japanese vessel. It seems that many people are downplaying the harmful nature of butyric acid, but it is far more dangerous than meny people's supposition. According to MSDS (Material Safety Data Sheet) for butyric acid, it is "Harmful if swallowed or inhaled. Corrosive. Extremely unpleasant smell may cause nausea. Liquid may burn skin and eyes. Readily absorbed through the skin. Severe skin, eye and respiratory irritant." MSDS also says “Acute dermal toxicity (LD50): 530 mg/kg [Rabbit]”, which roughly means you can kill a rabbit that weigh 1kg by administrating 530 mg of butyric acid onto the skin. The amount of the acid thrown onto the vessel is enough to kill more than several people. CERCLA (the Comprehensive Environmental Response, Compensation, and Liability Act) in the US classifies butyric acid in the category of “Hazardous substances”. Australian government must know the hazardous nature of butyric acid since the MSDS is available to anyone. I cannot understand why Australian government did not detain the Sea Shepherd members. Purchase and usage of harmful substances are usually regulated by law. The fact that Australian government has not detained them means that Australian government is supporting terrorism by the Sea Shepherd members. MSDS is distributed in various sites. I obtained one from www.sciencelab.com. Type "butyric acid" into the search box in the top page, and then click "search". You can find a link to the MSDS for butylic acid below "n-Butyric Acid, Reagent". Also, you can see a shortened version of the MSDS at the following URL. aki, thanks for this information.